With a membership to Cinema/Chicago, every few weeks there’s another screening of an upcoming feature. Over the year, I’ve been able to see some stellar films and hear inspiring Q&As with directors, writers and actors. As these screenings usually take place during the week, it’s a nice way to unwind after a work day. This past week, we screened The Best Exotic Marigold Hotel. It features an all-star, British cast and does not disappoint. It’s about a group of ex-pats seeking solace, meaning and a new hip in India. The film is rich with colors, sounds and moments that feel all too real. But the film wasn’t the only thing I got that night. As this film skews to an older, mature demographic, there weren’t many young adults there, sans the staff of Cinema/Chicago. Didn’t bother me one bit, but if it weren’t for this film, I can assure you I would not have met a most fascinating person named Sandy. Sandy is probably somewhere over the age of 70, rents library books, quotes philosophers and has spent his years doing good in Africa, Europe and Asia. He’s basically the kind of person I want to become. We had great talks before and after the film where he told me things about himself and just things in general. When he found out I was a writer, we spent a lot of the conversation discussing linguistics, which I can honestly say, I’ve never given much thought to. We went our separate ways with the promise of catching an art exhibit. The one thing I took away from Sandy, was his comment when I told him that he’s had such an awe-inspiring life. And if we learned anything from The Best Exotic Marigold Hotel, that’s exactly what’s to come. It’s that time of year again, when the seasons change and moving trucks start hunting for places to park: Moving Day. Thankfully, Maggie and I have signed on for another year and we’ll embark on our…fourth year of living together. It’s crazy to think it’s already been three years and yet, it seems even harder to believe it hasn’t been longer. We love our current condo (and not really into apartment hunting), so staying was a no brainer. The amenities are fantastic, the location cannot be beat and we get a ton for what we pay. Plus, Maggie’s just spruced up that place to no end and I can’t imagine packing it all up and having to recreate her masterpiece of decorating somewhere else. As I think of the amenities we have (doorman, pool, gym, BBQ grills, laundry), I cannot help but wish we could add a library to the mix. In NYC, libraries are quickly becoming a perk in many residential buildings, just for the sense of peace, tranquility and calmness it exudes. The building with a library will have to wait another year, at least, though it’s something I’m for sure adding to my list when I have to do the hunt. Maggie and I decided we would marry off before we stopped being roommates, which means the day that we go out to find our own spaces, this will be us. End of an era indeed. Still reeling from the amazingness that was Saturday. 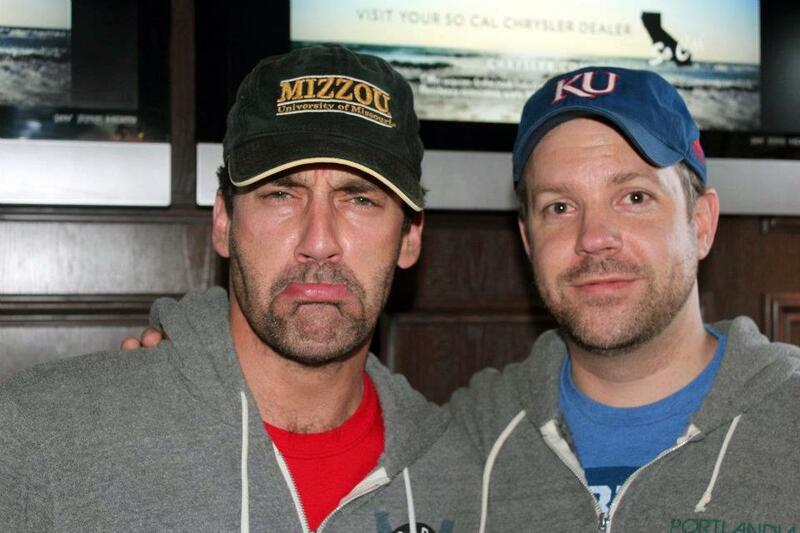 And then I saw this, Jon Hamm and Jason Sudeikis at a KU Watch Party in LA. And then the sun decided to shine so brightly and while walking to the library, iTunes thought this song would be appropriate. It’s alright for a Monday. Every winter season in Chicago, I find a TV show and series to carry me through the winter blues. It helps keep me sane. Last year, it was Friday Night Lights. The year before, Modern Family. And this year, while Dexter appeared to be my new favorite show keeping me trapped in my room dressed in sweats, it isn’t. After hearing much about Downton Abbey on all of the blogs I read, I decided to look into this show, which I’ll admit, I thought was Downtown Abbey. This miniseries airs on PBS Masterpiece and follows the lives of one aristocratic family and their servants–a bit a rather enjoy. I’ve now found myself unable to stop thinking about the show and wondering when I’ll get to watch it again. And despite appearances, it has nothing to do with the accents. It’s all about the music and that library! I’m sure my dreams appreciate going to sleep after watching an episode about the Crawley family instead of the serial killer ways of Dexter Morgan. While things with Jeff and Dan never panned out, Harry didn’t disappoint. I can still remember the time when my mom introduced Harry and I to one and other. So I did it. I made the eyes-closed, heart-stopping, stomach-churning dive into love with one Harry Potter. Harry saw me through my awkward teen years and just when an ending was in sight (only 7 books in the series?!) he decided to come to me in person (on the big screen). Then, I got to meet him first hand at the Museum of Science & Industry last year. As Lisa can attest, I was a mess. A complete and utter mess. A 23-year-old who waited a decade for this kind of magic finally got to throw a quaffle, walk through a mock great hall and wave a wand. Now, Harry just opened The Wizarding World of Harry Potter theme park. Have yet to go, but I know he simply won’t disappoint me and I can almost taste the Butter Beer. Today, the latest trailer for the final Harry Potter film came out and I nearly broke down into tears. It’s all coming to yet another end. And like all good relationships, I found myself reminiscing on the great times Harry and I had. 1) Graduation parties. High school ended and I brought Harry (and the Half-Blooded Prince) to four graduation parties. I vividly recall reading in Mallory’s silver Alero and sneaking out of the party one (or a few [or a dozen]) time(s) to spend a few more minutes with Harry. 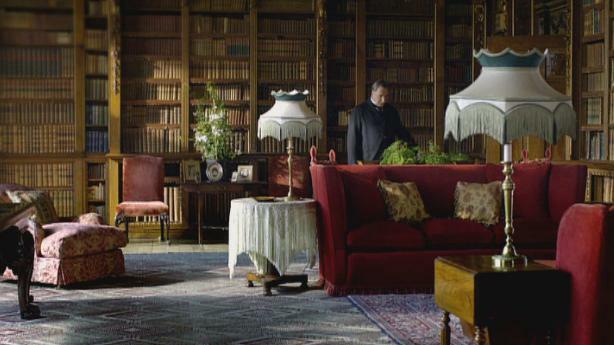 2) Hanna, in the library, with Harry. After every book launch date, you could find me curled in the maroon chair in the green library of Mom’s with Harry and sipping on Raspberry Tea. I refused to leave, often eating cheese slices and Mint Milanos right off the Table of Wisdom. 3) Midnight movies. Robbie and I went to the first three movies together. The fourth, with my college roommate. The sixth, with an old pal in Chicago. I have only missed one midnight showing of Harry (#5) and that’s because I was abroad. I promptly saw it the next day in a room full of undevoted muggles. 4) Book release party. I never went to the book release parties for Harry’s 1-6 years. I just wanted to reserve it, pick it up and head home to read it. Just him and I. When book 7 came out, I was in Dublin. I made good on my commitment and reserved it at Eason’s downtown. All the other students were gearing up for a weekend in London, which meant I wouldn’t be able to pick up my book for THREE WHOLE DAYS after the release. Unacceptable. I stayed back. Stood in the Dublin rain for 4 hours with people who weren’t even alive when Harry first surfaced. I remember the excitement of running in. The dilemma: Children’s version or Adult version? We didn’t have this problem in the States, but alas, here I was. To the left: Adult. The Right: Children’s. People yelling at me to move along. Stop holding the que. I made my affirmation of “Adult.” Harry and I were ending our childhood journey and beginning an adult one. With only two more movies and the amusement park hanging over my head, I’m nervous to see our journey really truly end. Each other time we simply took a break; now it’s really going to happen. It’s safe to say whoever comes around next is going to have one hell of a cloak to fill.